By franklparker in Monday Memories on April 15, 2019 . Burning tires, though. Peee-uey. Didn’t that stink? We had a tall chimney, Phil – and I guess the smelly gases released by combustion were the ones that gave us the energy return. 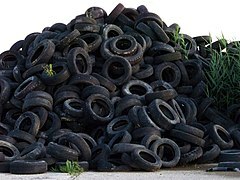 As I noted in my caption to the image, Wiki says that across Europe 95% of scrap tires (I’ll spell it your way this time!) are used in this way, mostly in cement production, saving on fossil fuel use.